Pens, they’re necessary things. If not for art, then for simple, day to day life. You won’t believe how may people I’ve run into that need pens and don’t carry them around. 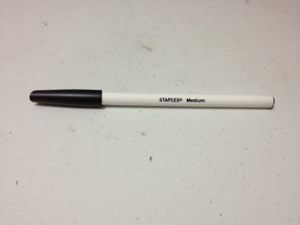 Okay, maybe you wouldn’t, but I’m still going to quickly talk about a cheap way to get your pen fix so you can jot down notes and stuff (as in peoples’ numbers): the Staples Medium Ballpoint pen. The pens are simple: a small plastic tube, containing a smaller plastic tube filled with ink. The tube is slick, but not slick enough to have the pen slip out of your hands while writing. It has the logo and name on the side in plain lettering that isn’t prone to rubbing off. 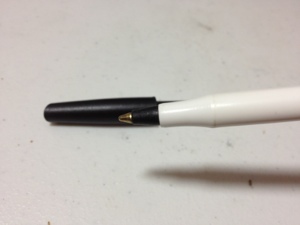 The cap also fits on nicely and allows the pen to be loosely held in a pocket. Overall, the body does its job. But what about the point? The tip is a ballpoint which produces a medium weight line with a very universal width. It will take a little bit of skill to get variation from this pen. But what one would want out of a pen like this is reliability, and that is given to one by the constant line. The pen, however, does at times need to be coaxed into writing and will dry up beyond usability if neglected for too long. It’s a nice cheap pen. It’s nothing spectacular, but for the price, nothing is. It is great for jotting notes, getting ideas down, writing drafts and piling around the house so you’re never pen-less.